Eastern Neck National Wildlife Refuge is a magical place in Maryland. 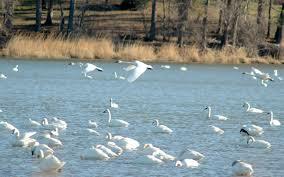 Located at the mouth of the Chester River as it enters the Chesapeake Bay, Eastern Neck Island is a wintering habitat for thousands of waterfowl (including the tundra swan) that migrate each year to the Bay. During a visit to the island I experienced a sense of maternal protection extending over the woods and marshes. This feeling inspired me to write a lullaby. It was originally in a traditional style. However, I decided to take the music in a different direction. Keeping the diatonic melody, I reharmonized the tune with modern chords. Recorded by David Arivett. Marty Hoover wrote an article about this tune for the Winter 2018 edition of The Rookery (publication of the Eastern Neck National Wildlife Refuge).